"Red Trunk" sculpture at the corner of Third and State Street. Many people who were born or have lived in Rockford have had success worth mentioning. Here are only a few of them. lawsuit but died from tuberculosis two weeks after the trial. He held 29 patents at his death. 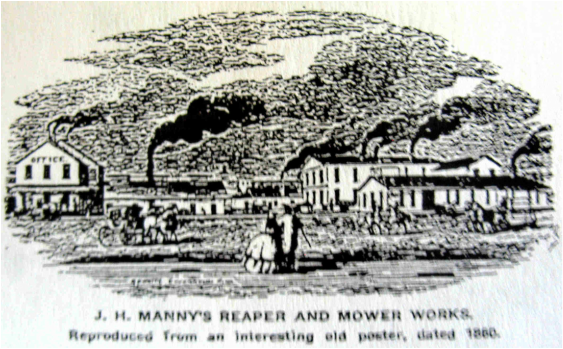 The company continued to make reapers and made his widow quite wealthy. She later married Robert Tinker who worked for her and who built The Tinker Swiss Cottage. The lawyers for Manny in the reaper case were Edward M. Stanton, George Harding, P. H. Watson and Abraham Lincoln. Lincoln was still a country lawyer from Springfield while Stanton was a well known lawyer from Cincinnati. Stanton and the others were unimpressed by Lincoln's appearance and snubbed him at the trial. Lincoln told Ralph Emerson of the Manny Company that he realized he needed to go home and study the law more vigorously to keep up with the legal minds in the east. Regardless of the snub, Lincoln was impressed by Stanton and appointed him to his cabinet as Secretary of War. Julia Lathrop was born in Rockford, attended Rockford public schools, Rockford Female Academy (1 year) and Vassar College. She graduated from Vassar in 1880 then spent ten years working for her prominent father, William Lathrop, in his law office in Rockford. She went to Chicago in 1890 to help Jane Addams run Hull House. A tireless worker, witty, and devoted to helping people less fortunate than she, Julia worked tirelessly to improve the lives of the elderly poor, the mentally ill, and poor and immigrant women and children. 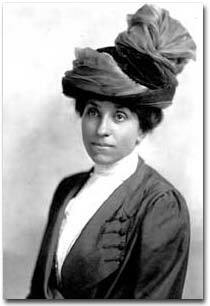 Before women had the right to vote, she was chosen as the first woman to head a federal agency, The Children's Bureau at the Dept. of Commerce & Labor in Washington, D.C. Her work there led to policies for helping mothers, children, and the poor based on solid research and evidence. located in the﻿ North﻿ ﻿Center ﻿neighborhood on the north side of ﻿Chicago﻿, ﻿Illinois﻿. Lathrop Homes is one of the first Chicago public housing projects. It was completed in 1938 by the ﻿Public﻿ ﻿Works﻿ ﻿Administration﻿. Lathrop Homes was placed on the National Register of Historic Places in 2012 and is currently undergoing restoration. 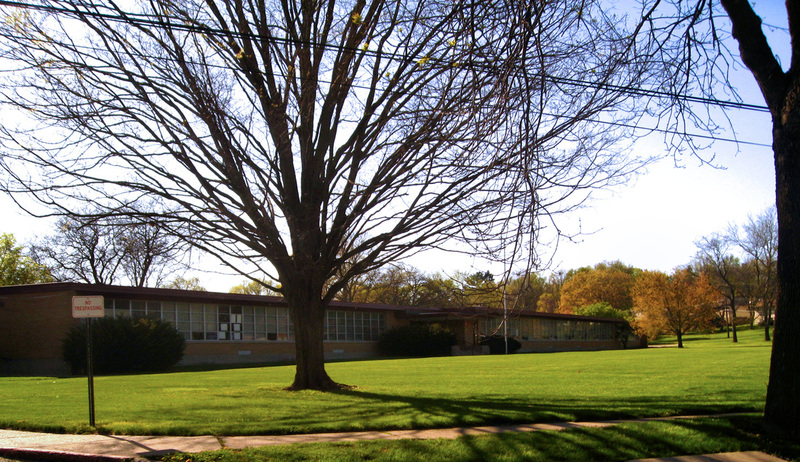 In addition, in 1957, an elementary school in Rockford was named for her. 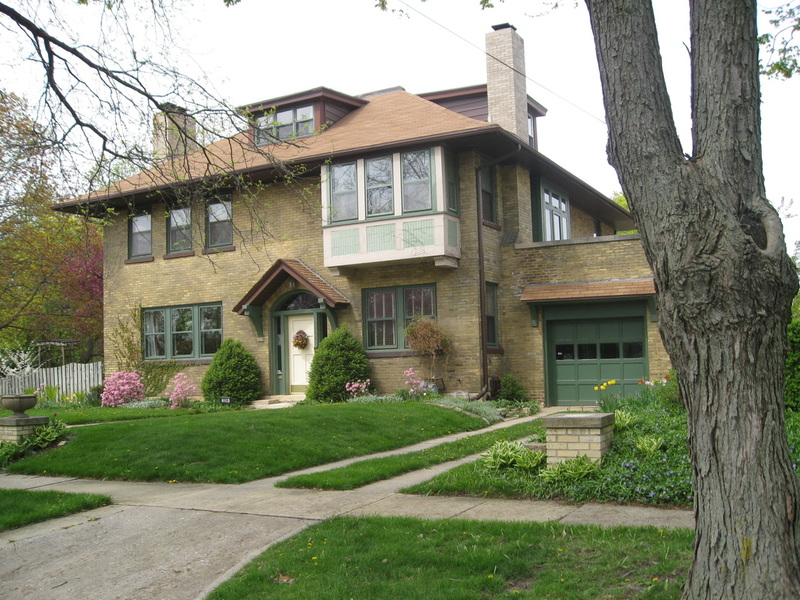 The home she and her sister built on National Avenue after their parents died still exists. Two of her brothers also had homes on National Avenue. 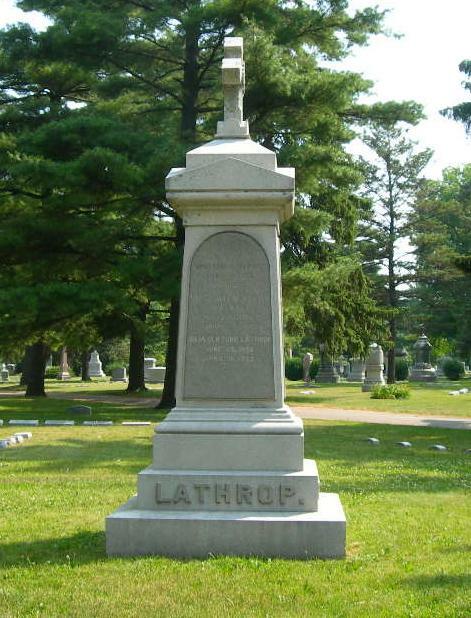 Julia Lathrop, her sister, her parents and other family members are buried in Greenwood Cemetery in Rockford. To learn more about Julia Lathrop read My Friend, Julia Lathrop by Jane Addams. Jane Addams book about Julia Lathrop, published after Addams death. Lathrop preceded Addams in death. 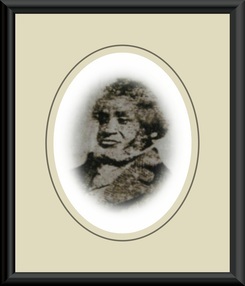 Rockford founding team member and first black resident of Rockford, Lewis Lemon came with Blake and Kent in 1834 to establish a settlement. Born a slave in North Carolina in 1812 , Lemon was purchased by Germanicus Kent in Alabama in 1829 . When Kent came to Illinois, he brought Lewis Lemon with him. Slavery in Illinois was illegal by both governing documents of the state, the Northwest Ordinance of 1787 and the Illinois Constitution of 1818. Slave owners circumvented the law by drawing up "contracts" that were voluntary servitude agreements. Kent and Lemon had such an agreement. Both men kept their word and Kent wrote a manumission document for Lemon in 1839., freeing Lemon. It was recorded in the County Court in 1842. Lemon died in Rockford in 1877. He was buried in West Side Cemetery (Greenwood) by the Rockford Early Settlers' Society. His grave was unmarked for nearly a hundred years. In 1975, some middle school students rediscovered his grave and donations were sought to buy a marker. The marker was installed with ceremony. Recognizing his contributions to Rockford's early history, the Rockford School Board named a school, the city named and intersection, and the library named a branch in his honor. Lemon spent more than a third of his life as a slave or indentured servant, he likely could not read or write, and he died in poverty, but success does not always lie in material accomplishment. Lewis Lemon was undoubtedly a good man, liked by all who knew him. In 1859, his former master Germanicus Kent wrote to his brother, Aratus, "When you see him, tell him I would very very much like to see him one more time." No picture of Daniel Shaw Haight has been found to date. Haight and his wife Mary Stearns Haight, sister-in-law Abigale Stearns, two year old son, and hired hand were the fourth through eighth non-Indians to come to Rockford to settle. Mary and Abigale were the first white women to permanently settle in Winnebago County. Haight was determined his settlement would succeed and he worked tirelessly to make it happen. He was the first sheriff, the first postmaster, the first village president, He was Rockford's east side founder and leader while Germanicus Kent was the west side's founder and leader. He donated property for an east side town square (now Haight Park), and established the east side cemetery (now Cedar Bluff although the site was moved). He built many buildings and homes all of which have been demolished. His was the first cabin and first frame house on Rockford's east side. The house was originally at the northeast corner of State and Madison but was moved to the northeast corner of North Second and Walnut and was razed in 1906. He built the first post office, and the second. He built a court house, and a school building on the east side of town. His barn was used for multiple purposes in the early days including church services. He wanted to build a better Rockford. He left Rockford in 1847. He went bankrupt primarily because the first dam in Rockford was unsuccessful. He was a financial contributor for the dam project, but also was liable when it failed. His trail runs very cold for six years, but he located in Shelby County, east Texas in 1853. His children are listed as members of the school. His wife, Mary, died that year. He remarried in 1854. He returned to Rockford only once in 1857. His mother, a daughter who died while they lived here, and another Haight family member are buried in Cedar Bluff Cemetery. The standard story in Rockford is that Haight became a Confederate soldier, but there is no evidence to support that statement. His name has not been found on any list of Confederate soldiers in Texas. In fact, he was probably too old to serve. By his own account he was nearly blind. The court house in Shelby County burned down in 1877 and with it went all county records. However, federal records exist of land transfer. He owned a federal land patent, and converted it to deed in 1863. His second wife remarried in 1864 so we may assume he died in 1863. Divorce was uncommon and not likely. His burial place, that of his wife, and that of his first son and his family have not been located to date. His daughters and their families are buried in Tarrrant County, Texas which is Fort Worth's county. 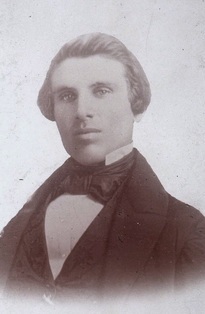 Anson S. Miller (1811-1891) came to Rockford in 1841. He was a well-known and highly respected Rockford lawyer, judge, state legislator, orator and Whig and Republican party leader. He was a friend of Abraham Lincoln and was appointed by Lincoln as Rockford's Postmaster in 1864. "That all men are born equally free and independent, and have certain inherent and indefeas­ible rights, among which are those of enjoying, and defending life and liberty, and of acquiring, pos­sessing and protecting property and reputation and of pursuing their own happiness. Must not the members of this House say at once, that this section is wholly prohibitory of laws which deprive persons of any of the natural rights of Freemen? First look at the Constitution, then at the degrading Statutes concerning witnesses which we pro­pose to repeal, and then candidly judge. Sir, comments are unnecessary, as the strongest argument against the laws, is the declaration of the Constitution itself. How men can be said to possess, the right to "enjoying and defending life and liberty, and of acquiring, pos­sessing and protecting property and reputa­tion, and of pursuing their own happiness," when they can be deprived of all these with­out redress in any earthly tribunal, I am at a loss to determine. The mere statement of the case proves the Statute a gross violation of the Constitution." Anson S. Miller was an able lawyer and politician, an Illinois state legislator, a Winnebago County judge, a farmer, Rockford Postmaster, friend of Abraham Lincoln, and a founder and organizer of the Republican Party in Winnebago County, Illinois, and the nation. He was anti-slavery and believed in equality for women. In 1845, he gave a speech before the State Legislature in Illinois on abolishing the "Black Laws" in the state. The state Constitution and the Northwest Ordinance of 1787 both forbade slavery in Illinois. The "Black Laws" were a way to diminish the rights of free black people in Illinois. His speech preceded those given by national leaders, notably William H. Seward and Salmon Chase, both cabinet members in Abraham Lincoln's first administration. Lincoln was present at Miller's speech and understood the atrocity that was slavery. He commended Miller on his denouncement of it. Known as the Mandeville House, this house was built in 1837 by Richard Montague when he came to Rockford. It was made of walnut beams sawed at the Kent saw mill. Montague sold the house to the Mandevilles and it was moved to the Mandeville property from its first location. This is the house in which Samuel grew up. It was the first frame house in Rockford on the west side of the river. It survived the wrecking crew until 1948. Son of Richard and Content Montague, early settlers in south Rockford, Samuel was born in Keene, NH, but came to Rockford with his family when he was six. He grew up in Rockford and went to school here. He went on to become cheif engineer of the Central Pacific Railroad in 1863. 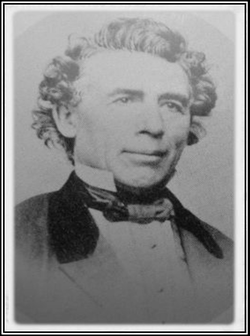 He was responsible for building the western half of the First Transcontinental Railroad which met the Union Pacific Railroad at Promontory, Utah and linked the east coast and the west coast by rail for the first time. The famous photograph of the meeting of two engines, one from each railroad, shows Samuel S. Montague at its center shaking hands with his counterpart from the Union Pacific Railroad, Grenville M. Dodge. Richard Montague​'s familly gravesite, ​Greenwood Cemetery: Rockford, IL. Samuel Skerry Montague is buried in California. His father, mother, sister, and step-mother are buried here.